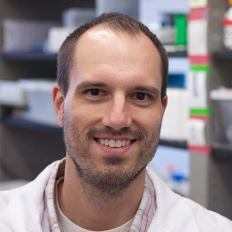 Daniel Gibson is an Associate Professor in the Synthetic Biology group at the JCVI. Since joining the JCVI as a postdoc in 2004, Gibson led the JCVI efforts to synthesize two complete bacterial genomes. Those projects resulted in creation of the first synthetic bacterial cell and development of an enabling suite of DNA synthesis and assembly methods. Prior to joining the JCVI, Gibson earned his Ph.D. in Molecular Biology from the University of Southern California. While there, he used yeast as the model system for studying cell cycle surveillance mechanisms (checkpoints), which are significant in our understanding of cancer development. Before earning his Ph.D., he earned his Bachelor's degree in Biological Sciences from the State University of New York at Buffalo. Nature methods. 2014-05-01; 11.5: 521-6. Gene and genome construction in yeast. Current protocols in molecular biology. 2011-04-01; Chapter 3.Unit3.22. Isolation of circular yeast artificial chromosomes for synthetic biology and functional genomics studies. Nature protocols. 2011-01-01; 6.1: 89-96. Chemical synthesis of the mouse mitochondrial genome. Nature methods. 2010-11-01; 7.11: 901-3. Nucleic acids research. 2010-05-01; 38.8: 2558-69. Synthesis of DNA fragments in yeast by one-step assembly of overlapping oligonucleotides. Nucleic acids research. 2009-11-01; 37.20: 6984-90. Creating bacterial strains from genomes that have been cloned and engineered in yeast. Science (New York, N.Y.). 2009-09-25; 325.5948: 1693-6. Nature methods. 2009-05-01; 6.5: 343-5. Proceedings of the National Academy of Sciences of the United States of America. 2008-12-23; 105.51: 20404-9.